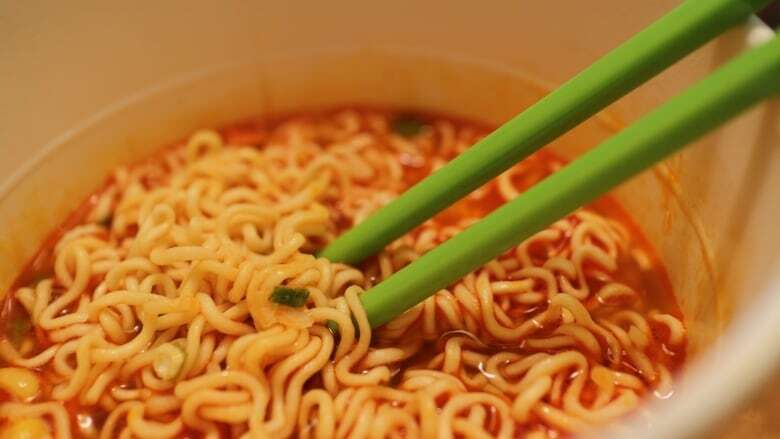 Microscopic bubbles in noodle dough could have implications for science ranging from the quality of your ramen to your future heart surgery, according to a member of a University of Manitoba research team that found them. Martin Scanlon, associate dean of research for the faculty of agricultural and food sciences, says looking at a sheet of noodle dough with the Canadian Light Source — the brightest light in Canada, housed at the University of Saskatchewan — was a "hail Mary." They were using the equipment anyway for other research and decided to try it on noodle dough, too. What they found was an "awful lot of bubbles," he said. "I mean, all very small … about a fifth of the thickness of a typical sheet of paper, was the average size for those bubbles. "There's absolutely no indication of their importance. There's nothing in the scientific literature that indicates that they're there." Scanlon and other U of M researchers have done research on bubbles in bread dough using ultrasonic techniques. They suspected bubbles could be found in noodle dough, too, but hadn't been able to find them using ultrasound. The find has implications for food quality, Scanlon says. For one thing, the bubbles appear to cluster, creating the possibility for unwanted cracks in the dough during the drying process. "From … a quality perspective, if you think of a lot of foods — ice cream, bread, now we can put noodles into it, meringues — so many foods have bubbles," he said. "Getting the right kind of bubble structure in those foods is intimately bound up with the pleasurable sensations we get when we actually eat those foods." The research will be published in the March 2018 issue of Food Research International. Proving the bubbles are in the dough will help researchers interpret their ultrasonic findings and shed light on the behaviour of bubbles in general, Scanlon says. "There was also this understanding associated with the fact that if we know how bubbles respond to an ultrasonic signal in these soft materials, that has implications in biomedical science and in food science," he said. He cites the example of bubble studies during echocardiograms, or contrast echocardiography, when doctors inject very small bubbles in saline into the bloodstream and watch their movement ultrasonically. "It's a good technique for that particular application to better understand the way that bubbles interact with things such as ultrasound," Scanlon said. Scanlon says figuring out the best way to make a noodle could help Canadian wheat farmers choose what they grow and how they grow it. "Everyone thinks of Canadian wheat being exported to Europe and turned into bread, and there is a fair amount of it. But about 40 per cent of wheat exports end up being used for Asian noodle products," he said. "So you might have quite a lot going out through Prince Rupert and Vancouver [B.C. ], where we need to understand how does Canadian wheat perform best to make good quality Asian noodles in Singapore, China, Japan and other regions in the Far East."